President Duterte made this request during his bilateral meeting with the Russian leader at the Grand Kremlin Palace here Tuesday evening (early Wednesday morning in Manila). It was made after President Duterte declared martial law in Mindanao, as Islamic State-backed Maute terrorist group besieged Marawi City and clashed with government troops. The bilateral meeting of the two leaders was initially scheduled on Thursday but President Duterte decided to fly back to the Philippines early Wednesday morning here. The meeting was moved to around 10 p.m. of Tuesday here — past 3 a.m. Wednesday in Manila. 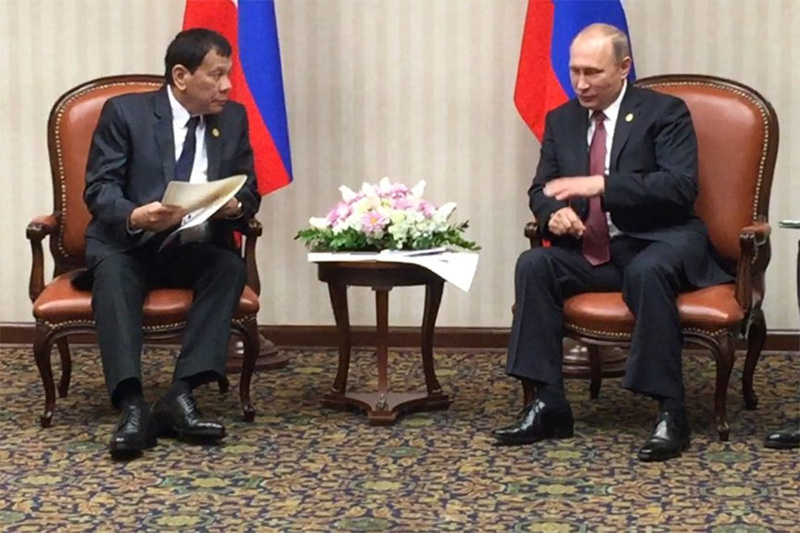 President Putin was not in Moscow on Tuesday but decided to return to Kremlin to meet President Duterte before his trip back to Manila. "As you probably know, I spent this day away from Moscow in one of our regions. And that I have seized the chance to see you in person," President Putin said. "My colleagues and myself definitely understand quite well that you do have to come back to return to your motherland," he added. The Russian leader also expressed his sympathy to those affected by the terrorist attack in Marawi City. "And let me express hope that the conflict that you have just mentioned will be resolved as soon as possible and with minimal losses and casualties," Putin said. He also assured that the full package of bilateral documents will be signed — a defense cooperation is included in the package of bilateral documents. In an interview with Department of National Defense (DND) Secretary Delfin Lorenzana here, he said Russia can help the Philippines in fighting against terrorists, particularly preventing the ISIS to spread in the country. "They are aggressive in fighting against ISIS," Lorenzana told the Philippine News Agency. "If you look at the current events in the Middle East, they are into heavily fighting against ISIS in Syria," he added. He mentioned that he and his Russian counterpart had discussions in Moscow last month prior to the visit of the Philippines’ official delegation this week. “We talk about this ISIS problem. This is a worldwide problem already, a global problem,” the DND chief stressed.